We really like this stove. After the Jetboil Flash caught fire and melted a little (read about it here), we started looking at remote canister stoves. These stoves are connected to the canister via a flexible hose, so don’t sit directly on top. 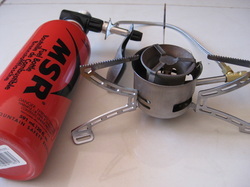 The reviews of the MSR stoves we read all complained about the fuel pump being too flimsy and breaking. The Primus Omnifuel on the other hand got rave reviews for being of solid construction and reliable. Our experience backs this up and it is the number one backup stove when we go car camping. Getting the old two burner (a 40 year old Primus my dad gave us), out just to boil the billy is overkill - though we must stress, it has never let us down, and still recommended for campers - but we here at Go Camping Australia, seem to have a stove that suits every occasion!!! And so when we want a quick boil, this is when the Omnifuel comes out and does the job in a jiffy. It takes a normal gas canister as well as Shellite, unleaded petrol, and practically anything else that will burn. Gas although simpler to use, starts struggling in cold weather, so we use Shellite (white gas in the US) for fuel, especially when we go winter camping. _The only thing you need to remember when you use anything other than gas is that the stove needs priming. It doesn’t bother us at all though. It just takes a minute to get the stove started. An advantage of being able to use multiple fuels is that you can use what’s available which may not be a gas canister. The Omnifuel does benefit from the aluminium windscreen which comes included. 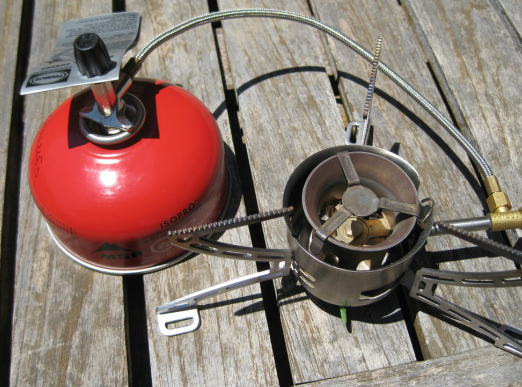 The Primus Omnifuel is a little noisy first thing in the morning though (think jet fighter doing a low pass), so something like the Trangia alcohol stove (more about that later) may be the go if you’re a considerate type and in close proximity to others. If you aren’t an early riser then you may get away with it. Oh, and the fuel used in these stoves can go BOOM, so as with all stoves, read the instructions before you use it. Even the guys!!! Best Used: Anywhere you want a reliable stove that is capable of doing a lot of cooking.